Are you looking to improve the quality of your writing and your storytelling skills? 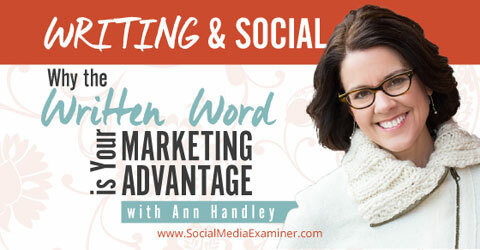 To explore why the written word matters in social media, I interview Ann Handley for this episode of the Social Media Marketing podcast. In this episode, I interview Ann Handley, the co-author of Content Rules and chief content officer at MarketingProfs—providing training and education to empower both large and small business marketers. Her newest book is called Everybody Writes: Your Go-To Guide to Creating Ridiculously Good Content. Ann shares why she decided to write a book for marketers about writing. 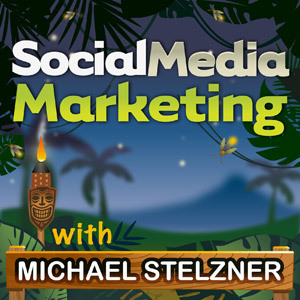 You’ll discover how to improve your writing for social media. Everybody Writes by Ann Handley. Ann explains that she wrote Everybody Writes because she looked for that book, and it didn’t exist. She wanted a book that was part writing guide geared toward marketers, part handbook on good sportsmanship in content marketing and part reliable desk companion for people creating content on behalf of brands and companies. So she wrote it! Ann wrote her first book, Content Rules, four years ago with C.C. Chapman. That was the beginning of the conversation about content marketing. These days, she explains, being able to write well is a necessity. Everybody Writes came out of Ann’s love for good writing and her desire to see marketers do a better job with their content. Listen to the show to learn more about Ann’s first book, Content Rules. Ann explains that since we’re all publishers in this age of technology, our words become our ambassadors. Our writing conveys a lot of things about us. It can make us seem warm, fun, competent and trustworthy. But it can also make us seem boring, humdrum and confused. Choosing the right words to tell our story is really important, especially when you want to connect with your customers. In a world where we all have a platform, whether it’s a blog or a website, words matter now more than ever. Listen to the show to hear what people said to Ann when she told them she was writing a book on writing. Ann believes we are all writers. If you have a website, work in marketing or post on social media, you’re a writer. To learn to craft better content, just develop the necessary writing muscles. Just like with physical exercise, work out your writing muscles. Image: Shutterstock. Ann talks about a story she tells in the book. As a non-athlete, she could never do a pull-up or a push-up. About a year ago, Ann started working with a personal trainer and then four months ago, she did a push-up. It’s just like writing. If you want to get better at writing, or at push-ups, you just need practice. Everyone is capable of becoming a better writer. Listen to the show to learn what keeps people from believing they can write. To get better at writing, you need to make it a priority. One tip Ann emphasizes is to give yourself permission to write badly and then fix what you’ve written. The main thing with writing content is to start somewhere. Write anything, and then edit it well. Listen to the show to discover what voice-to-text tools you can use to create early drafts of your content. All humans like a good story. The way you can tell if your story is good, Ann says, is as soon as you get into telling it, people listen more closely. That alone is a compelling reason to include stories in your content marketing. A compelling brand story, Ann explains, tells who you are as a business or organization and what you do for others. A story is a gift you give your audience as a way to connect. That’s the value. Ann tries to focus on the human element when she tells stories; for example, how a product or service helped a customer and why it matters. Stories feature real people and real situations. They tell the truth. Ann wishes more marketers would give her the backstory, because she’s curious about people and what makes them tick. Ann talks about the video I recently posted on Facebook. It was a good story shown through music and video. The mousetrap story is something people can relate to: getting knocked down and then standing up again. That makes a great story! Listen to the show to hear about Ann’s background as a journalist. The benefit of Twitter is that it really is a dialogue, Ann says, and not just a monologue. While many people use it to share headlines, they’ll get the most value from Twitter if they share the why as well as the what. 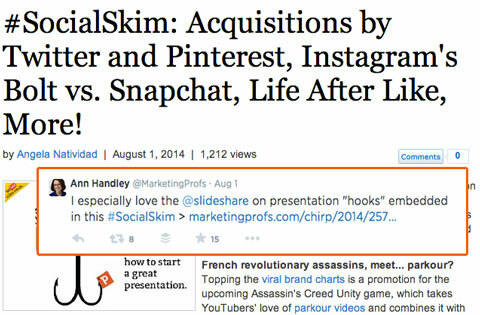 Article tweets from @MarketingProfs often quote interesting points instead of article titles. Ann shares an example from MarketingProfs. They had a story about ways to build your brand. Rather than using the title, they tweeted why they like a certain tip in the post. Something else Ann does with MarketingProfs’ tweets is to call out people who are active members of their community. She listens, pays attention to what they are saying and engages them in Twitter conversations. Listen to the show to learn a trick you can use to determine what is and isn’t news. In her book, Ann cites research from Andy Crestodina that shows ideal blog post length from a search perspective is 1,500 words. Ann explains, however, that there’s no hard and fast rule about how long a blog post should be. Whereas MarketingProf’s article length is 750-1,000 words, Ann’s posts at AnnHandley.com tend to be 1,200-1,500 words. Ann’s posts run long so she can give a lot of explanation and background. She doesn’t waste space, she just has a lot to say. Listen to the show to hear more about blog post length. Find out why the written word is your marketing advantage. Is part of your strategy to locate really interesting or popular content to share with your audience? If that’s the case, I have a really cool resource called Swayy I want to share with you. They have free and paid accounts, and you log in with your Twitter ID, Facebook account or both. It analyzes your audience and then shows the most popular, trending topics your audience is talking about. 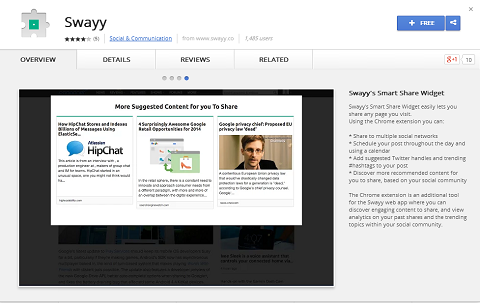 Swayy also has a Google Chrome extension to make it easy to share content. Swayy allows you to share content within the app. Or you can do what we do, which is use it as a discovery engine to find quality articles to schedule and share. This is our largest online event. It’s completely online, so no travel involved. There will be three sessions each day spread over an entire month. Each day has a theme, like social media strategy. To help you do everything you could be doing with your social media strategy, we have some spectacular sessions lined up. If you’re looking to pump up the volume of your social strategy, check out the keynote from Jay Baer of Convince & Convert. Jay will explain why it’s time for a strategy overhaul, whether you’re a small business or enterprise organization and he’ll offer tips on how to improve your social media results right now. 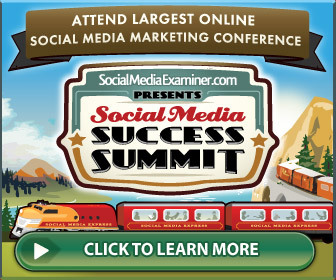 Jay is just one of 45 Social Media Success Summit speakers, which include Mari Smith, Mark Schaefer, Amy Porterfield, Bryan Kramer, Nichole Kelly, Pat Flynn, Lee Odden, Joe Pulizzi, Kim Garst, Martin Shervington, Neal Schaffer, Viveka von Rosen, Gideon Shalwick, Stanford Smith, Cliff Ravenscraft, John Lee Dumas, Sue B. Zimmerman, Andrea Vahl and Todd Wheatland. Follow Ann on Twitter, Google+, Pinterest and Instagram. 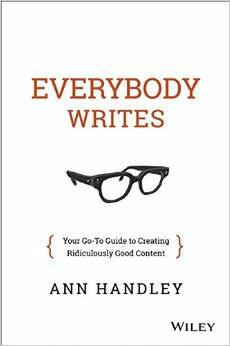 Learn more about Ann’s books: Everybody Writes: Your Go-To Guide to Creating Ridiculously Good Content and Content Rules. Explore Swayy to find good shareable content. What do you think? Do you blog and use social media for your business? Do you use storytelling in your social media marketing? Please leave your comments below. 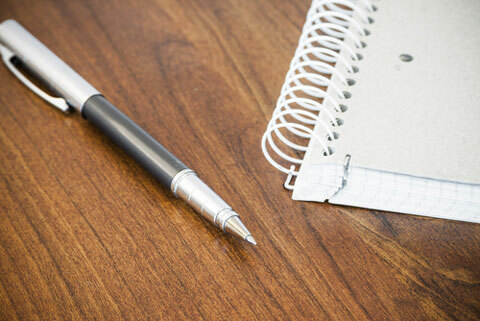 Pen and coiled notebook photo from Shutterstock.